Don’t forget articles and watch out for your context! Definite: The word the signals a particular noun or an identifiable noun. Indefinite: The words a and an signal a singular noun that has a plural form. Partitive: The word some is the English equivalent to a partitive article that signals a mass noun. Ensure your subjects and verbs agree! Wrong: He and his friends is at the game. Right: He and his friends are at the game. Avoid using the wrong verb tense! Ensure your verbs use the correct tense – e.g., past, present, and future. Wrong: Yesterday, I buy apples and make a pie. Correct: Yesterday, I bought apples and made a pie. Want more grammar tips? 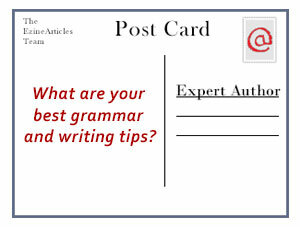 Browse the Grammar Tips category and don’t forget to share your writing and grammar insights in the comments section below – we’d love to hear from you! If in doubt, throw in a comma? As we discussed not too long ago, the incorrect use of the apostrophe. To those who know their grammar, it’s so glaring an error and so easily avoided, that the mistake screams our ‘INCOMPETENT’! All the apostrophe grammar rules can be put on a small sheet and used to check your text when you go over it, so there’s not excuse for getting it wrong at the proofreading stage. The main slips are using an apostrophe in a plural or a personal pronoun; and omitting it in a possessive. Esay to fix; a crime not to try! And in any case, a grammar checker such as that in Microsoft’s Word will pick up nearly all of the for you. I agree with regards to apostrophes and please excuse my poor grammared joke above. Even when you know these words in-and-out, accidental typos happen and spell-check won’t always catch them. Having one of these grammar mistakes in your copy is a great way to make your readers think you’re incompetent or flat-out lazy. One grammar tip I would advise would be to avoid run-on sentences. I see this in alot of articles and it’s a pain to read an article with run-on sentences in it. Many grammatical errors in writing is not lack of knowledge of correct grammatical rules , but rather typographical errors. Grammatical errors are at times due to the local and the global usage of the language. At times,we do not find any error in our article after proofreading but still the editorial team finds them.I believe only the practice can make you perfect. Grammer is challenging to master, especially when Enslish is a second language. This applies to grammar, spelling and writing in general. Good writing is a result of three things: revision, revision and revision. Use them all and your writing will improve vastly. a lot (two words) of problems. Sorry Randall Magwood. I just HAD to make the point. I know the difference between they’re/there/their but tend to use them indiscriminately when I do my orignal draft. If I notice while I am writing that I have thrown in the wrong word, I don’t go back to change it because I am more interested in getting the idea recorded, but that means I have to be very careful when I edit to look for things that sound right to the ear but look wrong in print. Spell check won’t help when ewe have used the wrong word but spelled it correctly. 1) The machine is only offering suggestions. Sometimes the way you had it is correct in your context, so you still have to know the grammar rules! 2) Set the grammar checker to the style of English you’re using. 3) After using the word processor, import the text into a basic editor like Microsoft’s Notepad (free with all versions of Windows). THEN paste it into your article editing box from the Notepad window. This is to eliminate the ‘smart text’ like handed quote marks and smart dashes. Most sophisticated editors insert these for you automatically, and they’re a pain to switch your word processor in and out of. Smart Text is great for letters and books, but HTML in web pages and emails can’t read it, and it messes up the article when people lift it to use in their own stuff – which is what you want, don’t you? EzineArticles pages are clever, and translate this stuff well, but the user you’re trying to attract probably can’t, and your text ends up looking like a mess of strange characters. Thanks, David, the advice about moving written text to Notepad before uploading is great and I’ll be doing that from now on. When your first language is Spanish in my case you try to correct any gap on the language you are learning and I have seeing cases where Native Spanish speakers have a better Grammar than Native English and the reason is because internet is the learning school. Also I heard from a Technician saying, “You don’t get enough signal because your room is tailing” is this well said? the comma is the most common punctuation mark and the most misused. There are a lot of great tips on this page, by the author and commentors! This is a great topic. I’d have to say to watch out for verbs. Thanks all. There are a lot of great tips on this page, by the author and commentors! This is a great topic. Its necessary to understand the difference between past indefinite and present perfect bcz both indicates the action in past but past indefinite is used where the words indicating past are there like yesterday, 3 days ago, just now, 4 months back, last year/month/week etc. Thanks, Tanu, but what you wrote is already making my head ache! One way that non-native English speakers have an advantage over the natives is because they had to learn the language complete with grammar rules, and that always seems to include an emphasis on tenses. We native speakers, whether in the UK, Oz, India or wherever, learned it as children and picked up the tenses and parsing by listening and speaking long before we learned to read and write. So tense use is almost instinctive and we can’t always explain why something ‘just feels right’ – and probably is. So. Tanu, if you give me an example, I can see what you mean, but if you quote me declensions, I’m stumped! Useful for refreshing the language when English is a second preference in many parts of the world. #2) THEY ARE over THERE with THEIR friends! This helps keep perspective of how the word really is intended to be used. If you discover you’ve started a sentence with “there is” or “there are,” figure out a way to get rid of these space wasters! Oh, I dunno, Virginia! Starting a sentence this way can be very useful when you’re doing technical, scientific or academic writing – the impersonal and passive is good there. But, as you say, if we want immediate, attention-grabbing and personal articles, avoid this circumlocation like the plague. So I tend to use this kind of language when I’m wanting to impress the reader with my expertise, and that will be vary rarely for more than a small part of any article. And I only do it anyway when I want to make sure the reader knows that I’m repeating expert knowledge, not my own skills or my own opinion – for those I want to be personal. I used to have problems with “its” and “it’s” until I read the rhetorical question; do other possessive pronouns have ‘s like “his” “hers”, “ours”, “theirs”. I used to occasionally teach English, Randall, and I found that at 7th grade up, it always got most people. When they were younger, it was easier because they knew less about using English and they simply memorized what to do. So let me spend more words unpacking “apostrophe in pronominal possessives” than the article could do without boring everyone’s pants off! English is probably the loosest of all the major world languages in its grammar. I was taught as a kid that English had strict grammar rules, like Latin, but that there were a lot of ‘irregular’ words which had to be memorized. While there’s something in this idea, the truth is that English has spent many centuries abandoning its grammar rules, tenses and special endings to words. Generally, basic words are now modified by adding a word to help, which is simpler. So now to the nub of it: a possessive pronoun (which is, with the adjective, a pronominal possessive) is a pronoun used to replaces a possessive noun. The possessive versions of our pronoun list above is: I > my; thou > thine; he > his; she > hers; it > its; we > ours; you > yours; they > theirs. You just have to memorize these, because you’ll have noticed that they are irregular – there’s no pattern to them. But once you know them, the rule is simple: THERE’S NO APOSTROPHE because there was nothing missed out. Of course, the only ones that can cause confusion here are the four ending in an ‘s’. Hope that clears it up – remember, it’s simple: memorize the pronouns, then remember that they don’t ever have an apostrophe.